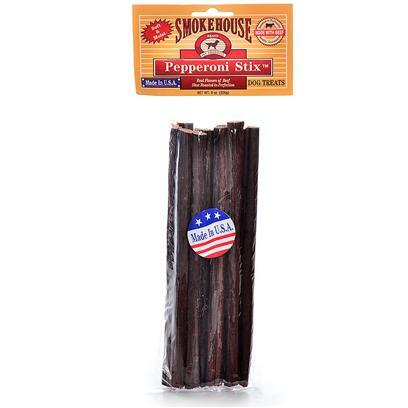 Smokehouse Pepperoni Stix are made here in the U.S.A. We baste them with molasses for the rich flavor dogs love. They are great for any size dog and can be easily broken into small pieces for little dogs or to use as training treats. Made from meat by products, beef, soy flour, molasses, dextrose, salt, natural smoke flavor, garlic powder, potassium sorbate, sodium nitrite and BHA.